Veeam Agent for Linux control panel is a GUI-like user interface that lets users perform main backup and restore tasks in an easy way. With Veeam Agent for Linux control panel, you do not need to work with Linux shell and remember numerous commands. However, some advanced Veeam Agent for Linux operations are not supported by the control panel and can be performed with the command line interface only. 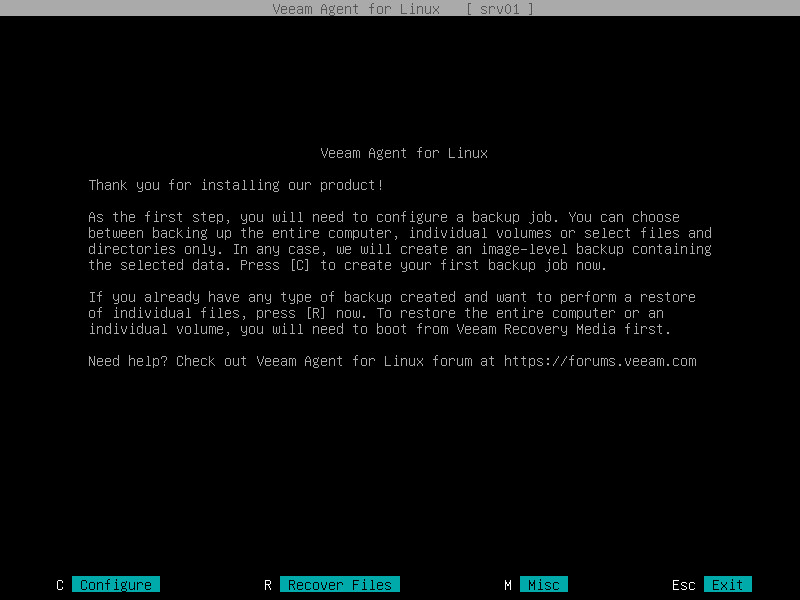 You cannot use Veeam Agent for Linux control panel on terminals that do not support colors (for example, VT100). Veeam Agent for Linux control panel is based on the ncurses programming library. To use the Veeam Agent for Linux control panel, you must have the ncurses library installed in your Linux OS. To learn more, see System Requirements. When you launch the Veeam Agent for Linux control panel for the first time, Veeam Agent for Linux offers you to perform initial product setup. To learn more, see Performing Initial Setup. Configure a new backup job. Restore files and folders from existing backup. Manage license and product logs. After you configure one or several backup jobs, you can also use the control panel to start a backup job and work with backup job sessions. In the Veeam Agent for Linux control panel, the use of a mouse is not supported. To start an operation, you need to use a specific key on your keyboard. For example, you can press the 'c' key to start the backup job configuration, press the 's' key to start a backup job or press the 'r' key to start the file-level restore process. Short help information on the currently available operations and keys is displayed at the bottom of the control panel. Tab — to switch between controls and buttons in the Backup Job wizard. Up and Down — to switch between items in a scrollable list. Space — to select the necessary item in a list. The selected item's mark may vary in different steps of the wizard. Enter — to proceed to the next step of a wizard or to view details of the backup job session selected in the list of sessions. Backspace — to return to the previous step of a wizard (you cannot use this button to change wizard steps when a text field is selected). Esc — to exit the currently used wizard or close the Veeam Agent for Linux control panel.